An invisible mist humidifier may be used for adding moisture to the air. An invisible mist humidifier can help with chapped lips. An invisible mist humidifier is a device used for adding moisture to the air. A type of cool mist humidifier, it is also known as a wick humidifier, evaporative humidifier or an evaporator. It uses a wick and a fan to send cool, invisible mist into the air. Humidifiers are primarily used to make breathing easier, especially for asthma patients and allergy sufferers. The presence of a wick or filter is the biggest difference between an invisible mist humidifier and other humidifiers. An invisible mist humidifier uses a wick to absorb water from the reservoir, pulling it up toward a small fan. Some of the water evaporates, based on the humidity level of the air around it. Then the fan blows that evaporated water up in an invisible, cool stream of moist air. The most prominent benefit of an invisible mist humidifier is an increased ease of breathing. In dry air, the sinuses can become dry and inflamed, making it difficult to breathe. Dry air is especially common during winter but can also be caused by air conditioner use during the summer or other periods of warm weather. 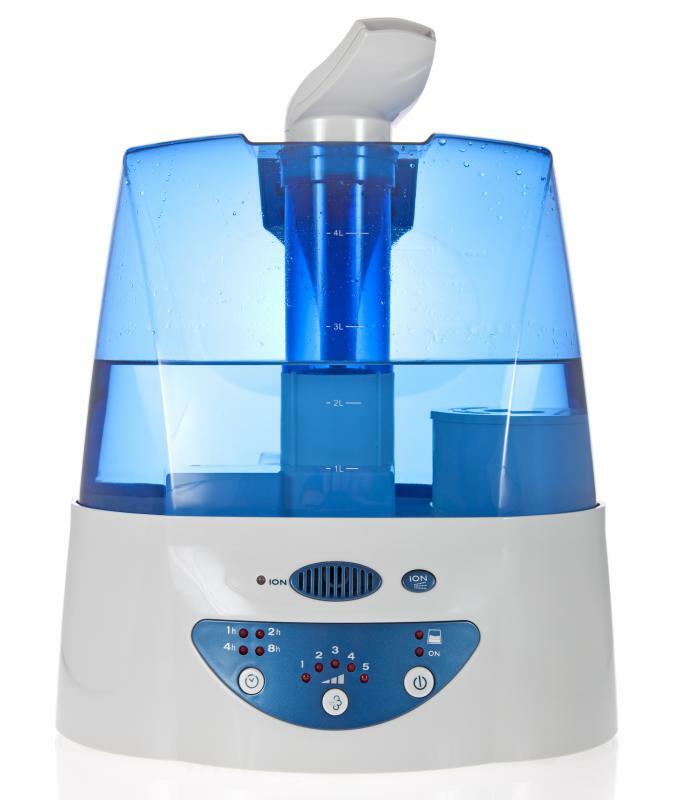 Many doctors recommend some type of humidifier for asthma patients to help them breathe easier. A few other advantages of using an invisible mist humidifier are that it can help lower pollens and other allergens and decrease dry skin and chapped lips. Some humidifiers also act as air filters, making them doubly attractive to allergy sufferers. In addition, many people enjoy the white noise provided by the fan. Daily cleaning with bleach and water is necessary for keeping a humidifier in its best condition. Tap water will leave sediments in the humidifier that are very difficult to clean, so it is best for distilled water to be used. The filter must be replaced whenever it becomes discolored, which happens about once a month if used daily. One reason why people choose this type of humidifier for the home is because of the safety of cool mist. A warm mist humidifier, or steam vaporizer, boils water to add humidity to a room. That boiling water can be extremely dangerous, especially for young children or pets. Therefore, most safety experts recommend using a cool mist humidifier such as an invisible mist humidifier. Another advantage of using an invisible mist humidifier is that it is self-regulating, unlike other types of humidifiers. As the humidity in the area rises, less water evaporates. When using any type of humidifier, one must be careful not to overdo it. Humidity in the home should be kept at 30-50 percent. Any less can cause irritation in the sinuses, and any more promotes the growth of mold and bacteria. What is a Mini Humidifier? How do I Choose the Best Humidifier for a Baby? What is a Steam Humidifier? What is a CPAP Humidifier? What are the Different Types of Home Air Purifier?